Now that the Holidays have come and gone, I am back to sharing some DIY projects from my Wedding Day. When my Wedding venue told me that our flower girl was unable to throw rose petals, I immediately set to Pinterest for some inspiration. I ended up finding a lot of cute “here she comes” signs and decided to give it a whirl! I created this cute little flower girl sign for under $20! Paint the wooden cutout (I purchased this wooden piece at Michael’s crafts for like $5.00 and just painted it white). They had a few different shapes and sizes too! Once the paint dries, stick the stickers on top of the wood (i.e. what you want the sign to say). Once the stickers have been placed where you like them, you can spray the sealant spray all over the front of the sign (be sure not to spray too much or it will turn yellowish). 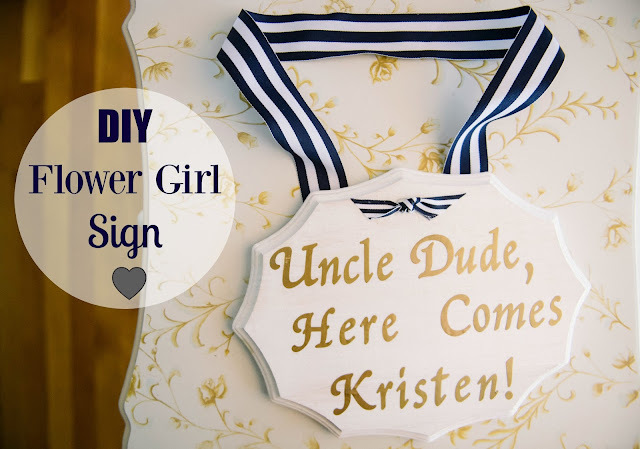 Once the sign has dried, you can cut your ribbon to length and staple gun it to the back of the wood so that your flower girl can wear it (don’t forget someone smaller than you will most likely be carrying this and that no one will see the back). Finally, if you want you can put a little bow in the middle to dress up the sign. Lastly, have your cute, lil' flower girl walk down the aisle with it! 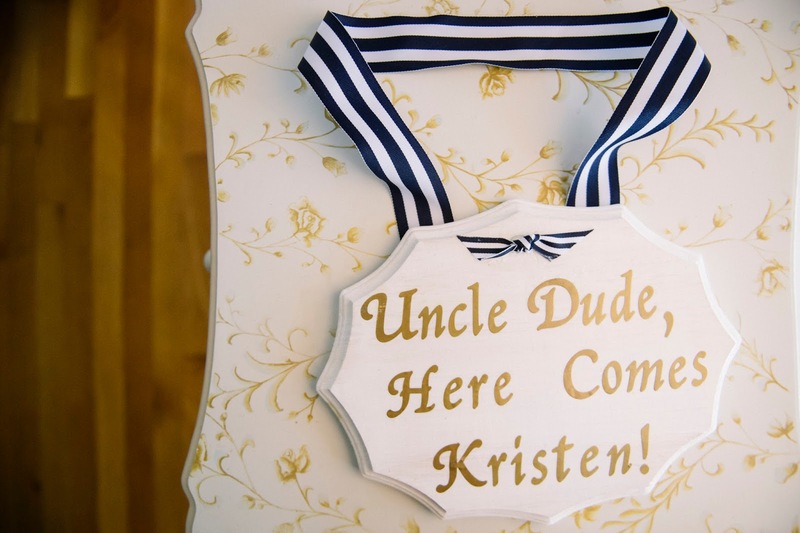 Our Niece and Nephew call my Husband "Uncle Dude", so I chose to make my sign "fun” by making things a little less formal and using his nickname. My Husband had no idea that I had made this sign, so it was definitely a cute little surprise that he LOVED and it also helped “break the ice” before I walked down the aisle. 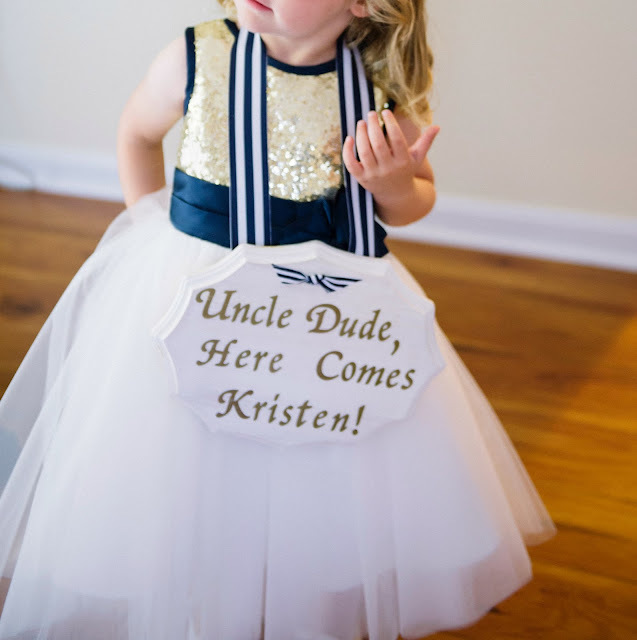 Did you create a sign for your ring bearer or flower girl!? Our flower girl wasn't allowed to throw rose petals either. I had her hold a pomander flower ball instead! I love the DIY sign though! Yes it's so strange that venues wont let you do that anymore! That was going to be my next choice if the sign didn't work out! That's such a great idea! Our flower girls couldn't throw flowers either so they carried the little flowerball, but this was definitely the best way to break the ice! Such a weird rule...Yes, the flower ball is super cute too! This is so cute! For my wedding we had 2 flower girls. One was my daughter, Allison and the other was my husbands cousin, Caiti. Caiti threw flowers while Allison picked them up. It was adorable! That sign is absolutely adorable! It matches everything perfectly! This is so cute & easy to make. I will definitely check out your other DIY posts. Thanks! 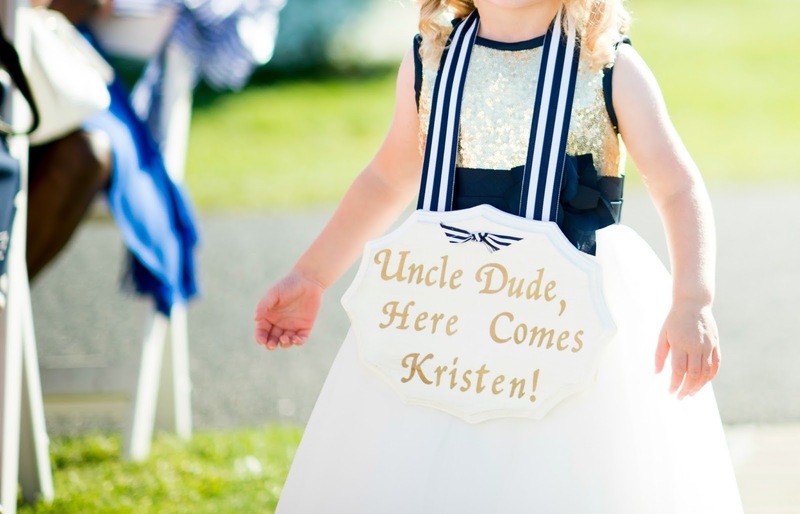 What a CUTE sign, and I love her little dress. The colors are so great together!